Happy Chef 2 is rated 3.4 out of 5 by 39. Rated 5 out of 5 by beckyjean from Finally, a challenging TM game. I am so thrilled to find a really good TM game offered. It has everything I look for in a game. It is very challenging. Graphics are cute. Love the ability to buy stuff. The only complaint I have is that it is sometimes difficult to pick up the toppings and place them on the food. You have to hit the sweet spot so they don't pop back. That raised the challenge level. 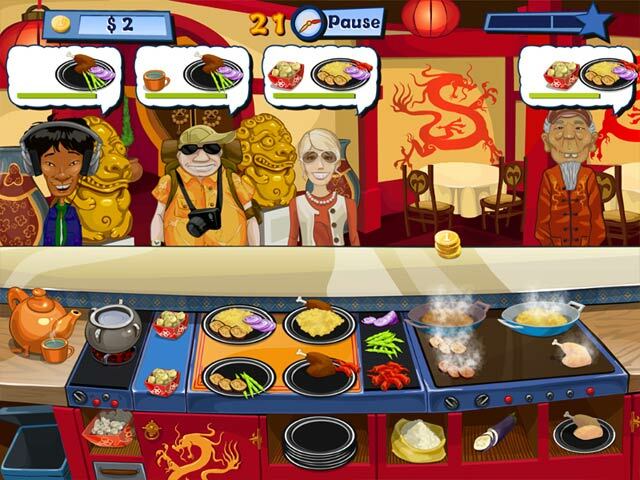 Rated 5 out of 5 by iLegend from Great Cooking Game I like cooking time-management games, and this game is great. You start in Italy and progress to other countries. Graphics are colorful, music is nice, and difficulty is adequate (so far). I like it. 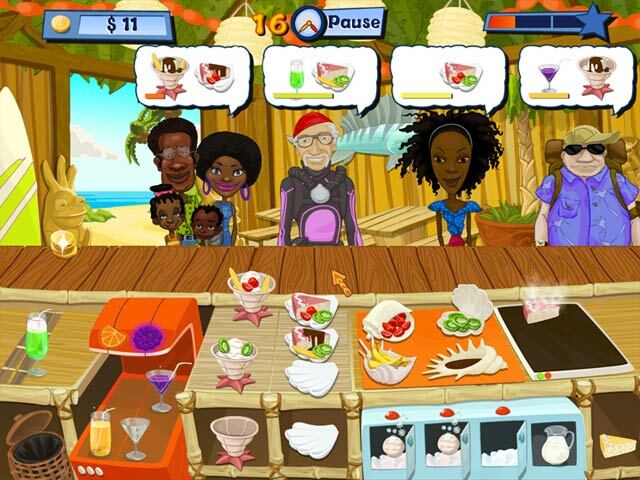 Rated 5 out of 5 by earthfairies from Love this Cooking Game I have always loved Time Management Cooking Games. 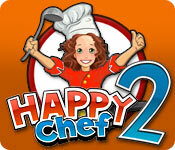 You have to be fast with the mouse while playing Happy Chef 2 but you will enjoy the fast pace. Rated 5 out of 5 by Rainbow007 from pleasantly surprised! Hi everyone, This is another 'food' TM what I was waiting for. I liked very much happy chef 1, so I did not hesitate to buy this one immediatly. And this is fun again! Buying upgrades, baking food and serving drinks. I also like the different characters. This is a 'must have' for all the TM and 'foodplaying' likers! Rated 5 out of 5 by KelseyCO from Wonderful and lots of Fun I really like this game and I have played the first one yet, I find this one a lot better, I had so much fun while I played the trial that I'm getting this game. It does become very addicting as another reviewer stated. I highly recommend this game to all those who like time management games and who long for the days of the Dash games and the Delicious games, this stands out like one of those to me. Have fun and hope you like this little gem. Rated 5 out of 5 by 39queenvictoria from ABOUT TIME I have been going through TMG withdrawal. It has been over a year and finally Big Fish got a totally real TMG.. This game is amazing and so worth the price. Keep them coming Big Fish. Rated 5 out of 5 by katnap123 from Seriously addicting game! This is a great TM game. The controls are smooth. The game is colorful. The instructions are understandable. There are lots of achievements to collect. Best of all: You can play in relaxed mode! ...anytime! I play TM games to wake up in the a.m., but I also play them to relax and for a change of pace. This game has everything I like in a TM game. Most of all, it's addicting. Give it a try, but be warned: This game gets challenging. Rated 5 out of 5 by pennmom36 from I'M SO HAPPY! 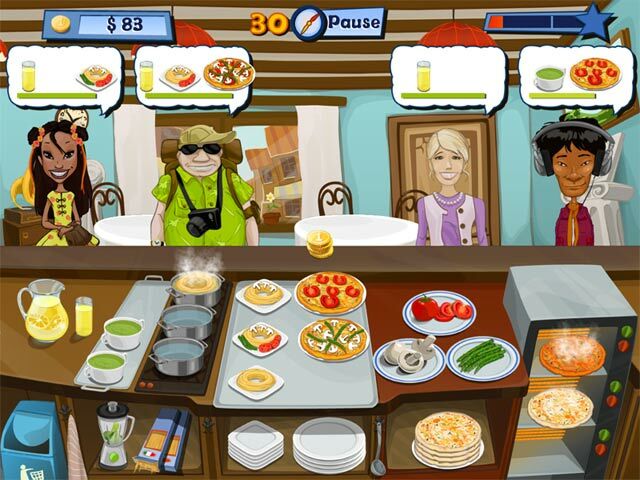 This is a fast paced game but you have the option of playing in relaxed mode. As customers arrive with different food items on their mind it is up to you to prepare, cook and serve, all while keeping the customer happy! You will click on the pizza to go into the oven and then click on a plate when the pizza is done you drag it to the plate, add the toppings they desire (I have never even thought of putting green beans on my pizza) and drag to the customer and collect their money. They may choose lemonade or pasta or soup and nuggets as well and if you burn something you have to trash it and loose money. There are upgrades where you can buy items to keep your customers happy or charge more for each item. As you progress in the game you can buy a machine that automatically takes money, or one that automatically trashes burnt food and even a machine that makes the pasta and soups. This is a very entertaining game to play, enjoy!